The economy is going strong and more people are looking to start businesses. That’s always good news – especially during Startup Week – because entrepreneurship and startup activity have suffered over the past decade or more. A stronger economy, higher confidence and better policies are creating a more favorable environment for startup activity and startup success. But there’s a key challenge holding back the potential of many startups – access to capital. Therefore, it is very important that small businesses and startups communicate with U.S. Senators – especially Democrats – to let them know of your support for JOBS Act 3.0. There is absolutely no reason to oppose this legislation. Every Senator should be an advocate for action! Again, JOBS Act 3.0 passed the House with massive bipartisan support (406-4). Call your U.S. Senators at 202-224-3121 and tell them to support this bill! It is bipartisan, it is needed, and it would make a big difference for startups and small businesses. The wedding business is booming, and if you are looking for ideas to start a business in this area check out the 50 Best Unique Wedding Related Business Ideas for 2018 at Profitable Venture. Americans’ appetite for dining out continues to grow and entrepreneurs can profit in this space if they have a great idea, great service, great food and can adapt to shifts in the marketplace, and of course the competition. This is the type of business where you can start small, be super creative, and effortlessly test the marketplace. These resources, What You Need to Know to Open a Restaurant by The Balance SMB and How to Start a Successful Restaurant from bPlans.com are good places to start for your research. Bonus resource: How to Start a Food Truck Business, and additional tips (and links to more helpful information) can be found here. Back to the issue of capital access…. As you may know, SBE Council was a champion of JOBS Act “1.0,” which made equity and debt-based crowdfunding legal. 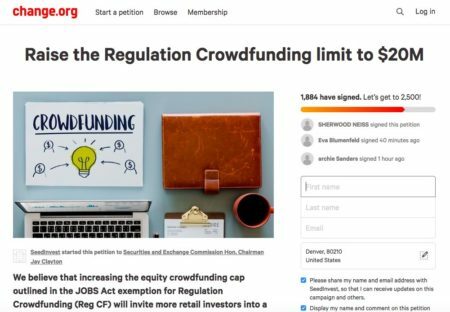 It took a very long time for the Securities and Exchange Commission (SEC) to write the regulations for Title III of the Act, but now that regulated crowdfunding (Reg CF) is off the ground, it is showing great promise for many types of small businesses in almost every corner of the country. 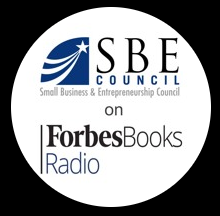 Listen to this informative and inspiring SBE Council-Forbes Books Radio podcast, where Sherwood Neiss, the author of the “Startup Exemption” and a successful entrepreneur in his own right, provides an update on Reg CF crowdfunding and what’s next on the reform front. There is a petition on Change.org that calls for an increase to $20 million! Sign the petition by clicking on the image below. We could use your help to reach the 2,500 signature goal. One more thing, Neiss reports that Belgium recently increased their crowdfunding limit to $5 million. Other countries are advancing reforms more quickly, as they are seeing solid results from crowdfunding. In the U.S., the results are positive as well – crowdfunding is an effective, transparent and investor-friendly way for entrepreneurs and startups to access capital, and in turn help the economy grow. Happy Start-Up Week to all!